Mother Nature. She’s always putting her nose in other people’s business. So it should come as no surprise that she is one of the catalysts for a floor squeak. Changes in your environment are pretty unavoidable. When extreme weather comes calling, it can negatively impact every arena of your life, including your home. Extreme moisture or higher levels of heat will cause your flooring to warp, to shrink or to expand, especially over time. Shrinking will occur during the colder winter months and expansion will happen in the summer. It’s a never ending train. When your floor warps, due to weather, it will become semi-detached from the subfloor. This is what causes the squeaks. Luckily, it’s easy to fix if you’ve identified the problem. All that you need to do is reattach the floor and ensure that you apply a weatherproof seal on top. Subfloors gone wrong. Subfloors are the foundation to all quality floor installations, it doesn’t matter what type or style. The subfloor is normally made from wood. If there is too much space in between the plans of the subfloor and the joists (gaps between planks), then you’ve opened your door (or floor) to the dreaded squeak. This is a tough one to DIY, you’ll most likely need to call in a contractor who can ensure that the planks and joists are properly secured and leave no margin for error. Lack of quality craftsmanship. We never like to point any fingers…in fact, we’d much rather be champions of the dozens of vendors and companies in the area who provide top-notch craftsmanship to their customers. We’ve been lucky to work with dozens of them over the course of our tenure. However, that doesn’t mean that it’s impossible to find a bad egg in the bunch. 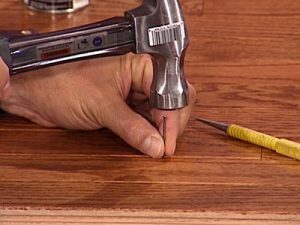 When adjacent planks are crowded together during the installation process, or the planks in the floor aren’t evenly set, they’ll begin to rub up against each other, or rub up against their hardware like nails. Thus, squeaking ensues. There are a couple of fixes that you can explore here. You can separate the planks using a circular saw. This may alleviate the extra pressure. If you’re looking for a more temporary fix, you can lube up the planks with a special spray. Of course, both of these would be completely unnecessary if you’ve done your preliminary research on the best floor installation companies in the business (cough, cough). Questions? Reach out to your Knox Carpets team. We’d love to hear from you.